For #WorldRefugeeDay the Fare network names a World Cup 2018 Refugee XI, featuring players from refugee backgrounds playing at the World Cup in Russia. 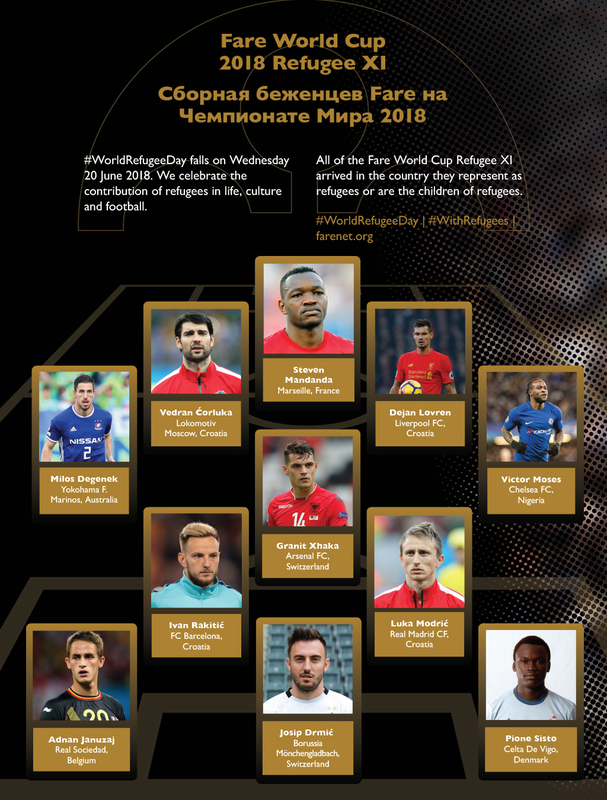 For #WorldRefugeeDay the Fare network has named a World Cup 2018 Refugee XI, a team featuring players from refugee backgrounds playing at the World Cup in Russia. The Refugee XI celebrates the presence and contribution of refugees to the World Cup and highlight the roel that football can play in breaking down barriers by highlighting achievement. All of the players listed are refugees, or the children of refugees, playing at the FIFA World Cup in Russia. “When I see what’s happening today [with refugees] I just remember my thing, my family and how people don’t want you in their country. I understand people want to protect themselves, but people don’t have homes. It’s not their fault, they’re fighting for their lives just to save their kids. I went through all this and I know what some families are going through. Give them a chance,” said the 27 year-old in ‘Lovren – My life as a refugee’. Mandanda and his family were forced to leave Kinshasa in the former Zaire, now the Democratic Republic of Congo, during the reign of Mobutu Sese Seko, and migrated to Liege in Belgium. Moses was raised in Kaduna, Nigeria. His father and mother were attacked in their home and killed when riots swept in 2002. He was told of the news when playing football in the street, before being sent to England where he was taken in by foster parents in south London. Lovren and his family had to flee their home in Kraljeva Sutjeska, former Yugoslavia, when the conflict broke out leaving hundreds of thousands dead. Born in the former Yugoslavia, Ćorluka moved to Zagreb in 1992 due to the war in Bosnia. As a child Modrić was forced to flee his hometown Zadar in the former Yugoslavia, with his family living in hostels during the Croatian war of independence in the early 90s. Xhaka was born in Basel to Kosovo Albanian parents. His family moved from Kosovo Podujeve to Switzerland shortly before he and his brother were born. Was forced to flee Croatia with his family before war broke out in the former Yugoslavia. They moved to Mohlin, Switzerland where Ivan was born and grew up. The son of Kosovo-Albanian refugees, Januzaj was born in Belgian capital Brussels on 5 February 1995. Drmić was born to Croatian parents in Lachen in the canton of Schwyz, fleeing the war. Born in Uganda to South Sudanese parents who fled the civil war, Sisto moved to Denmark when he was two months old.